Come on, sing with me, Oh I do like to be beside the seaside! Oh I do like to be beside the sea! Oh I do like to stroll along the couscous prom... wait, yes that's right we have sand made from giant couscous and grated cheese! The easiest beach friends to make. Sammy made 2 crabs but one got eaten before we put the box in the fridge! I adore this box so much. Yay! It has a neat band to keep the lid in place. I used food separators to keep the 3 main ingredients from merging into each other. I love how it looks as though the animals are buried in the sand. For everyone who has tweeted me a photo, it is wonderful seeing your creations. Make sure you link up your pictures here. 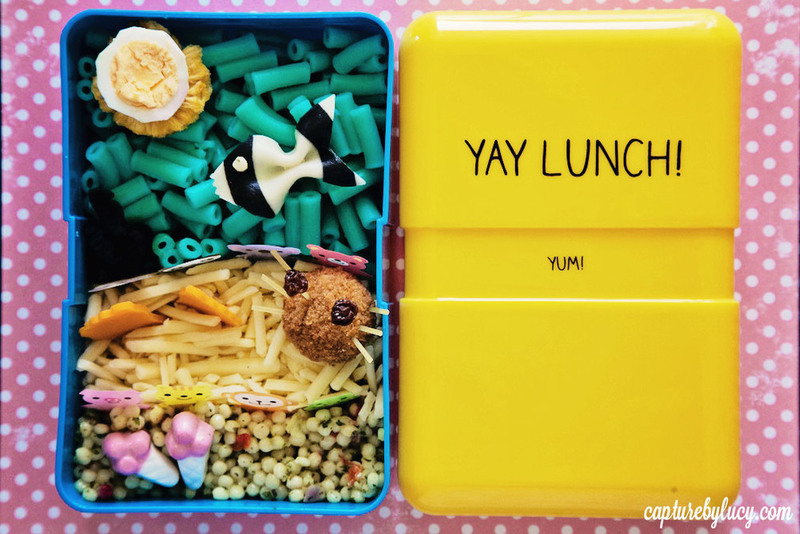 Bento ideas come from everyone sharing, so link away and I will add them to the Bento Babies Pinterest Board. I bought all of the ingredients in my local supermarket. Check out your dried fruit aisles, there are lots of interesting products that both children and adults will enjoy.